I like to revisit and photograph favorite and familiar locations, looking for unique points of view and fascinating compositions that I’ve not considered before. Sometimes that means using a new tool or technique to accomplish the goal. Though I’ve photographed the Palace of Fine Arts in San Francisco many times, my intention was to find a more creative way to make a few shots. I’m enjoying the advantage I now have using a new Nikon 8-15mm fisheye lens. This allows me to place my camera at super-low angles securely mounted to Platypod Max, and to work from many unusual and varied vantage points. Having the ability to photograph in a totally different way is an exciting challenge! With the blue hour approaching, I knew I would have a great opportunity to capture a ceiling shot from ground level. Along with the golden glow created by the many lights in the structure, I could also capture a deep rich blue sky that would accentuate the columns surrounding it. To make the shot I used my Nikon D5 and Nikon 8-15 mm lens (mounted and secured to my Platypod Max with the Really Right Stuff BH-55). This combination will easily hold my camera immobilized in the “limbo” position, allowing me to securely shoot the top of the Palace of Fine Arts with complete stabilization. I pre-focused my camera and checked my composition, allowing a diagonal flow with the arches in the image. To be sure I had a variety of exposures to choose from, I bracketed several exposures by setting the self-timer for a 10 second delay. Doing this allowed me to exit the frame while the camera fired off a series of shots. In the meantime, much to my chagrin, I did have a few curious onlookers peer into the lens of my camera! 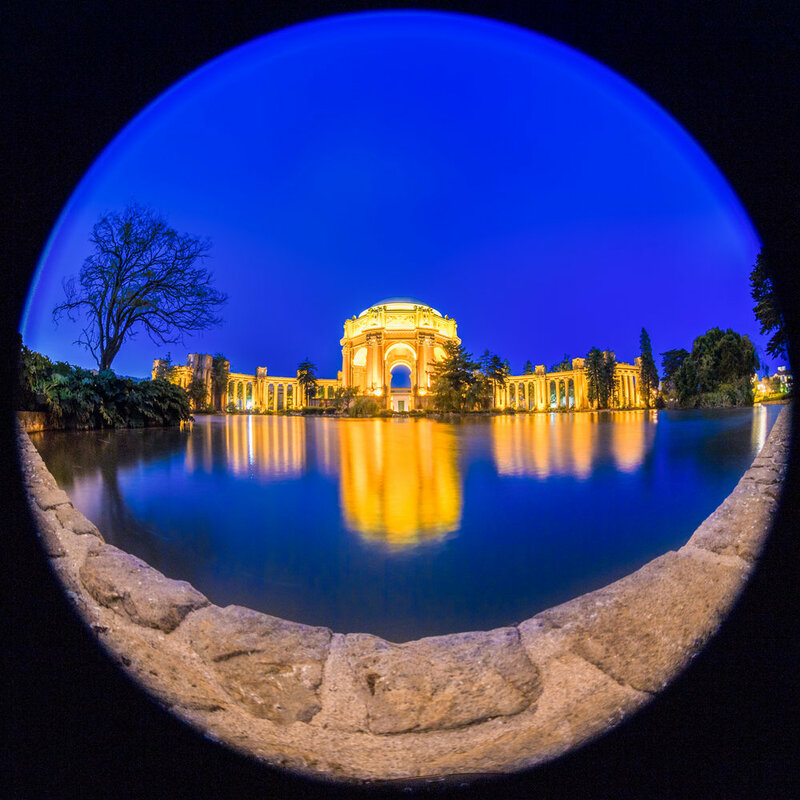 Working quickly, I walked around to the front of the Palace of Fine Arts for an all-encompassing view by using my Nikon fisheye lens at 8mm for a perfect-circle perspective. This creates a gem- like appearance of the beautiful architecture during the blue hour. I placed my camera on the edge of the lake as close as possible to grab a few shots before it got too dark. Stability is key as the exposures were made during the low light conditions of the blue hour. For the Palace exterior shots, I placed my camera at water’s edge, using a cable release to trigger the shot. For this type of shot, it’s best to hold your camera strap in case of any mishaps. I enjoy the increased ability to create unique captures of the architecture; they round out the conventional shots that I have previously captured with new and creative camera positioning. It’s a personal challenge to shoot the familiar and come away with a shot that is uncommon and beautiful. But more important, it’s not the same shot as I got before, and not the same as everyone else’s as they shoot next to me. We all come away with different travel shots— perspective is an individual gift—and that’s the beauty and fun of what we love to do!